To deal with the sudden influx of cheaters, the game mods have decided to revamp the series section. This thread specifically will be an archive of people who are banned from all GTA game submissions, to avoid having to make multiple posts every time and point people towards them. Hopefully this thread will silence any questions of "is X banned?" as they can simply check here. As we do not ban people without evidence, such evidence will also be listed here for people to see for themselves. Each person will have an entry listed, to avoid having to rely on a single mod to edit this every time someone gets banned. Anti - For editing handling of vehicles in order to gain an unfair advantage over others. Husho - For using macros, custom cheats and splices to create illegitimate Vice City Any% runs. 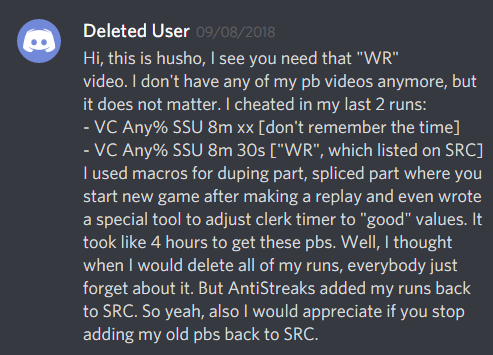 NOTE - While this evidence may seem non-conclusive, Husho authenticated himself to be this user at the time via a pastebin but this has since been deleted. FLYING - For submitting several cheated PBs to the San Andreas Leaderboard, and then refusing to cooperate with the SA mods to clear himself of subsequent accusations. TheGareY - For submitting cheated VC Any% runs under both his main and alt accounts. edit - GareY is now unbanned because of new evidence brought forward that wasn't posted at the time to show his intentions more clearly.